Alongside the well-known hazards of space — freezing temperatures, crushing pressures, isolation — astronauts also face risks from radiation, which can cause illness or injure organs. The Manned Orbiting Laboratory was conceived as an experimental laboratory for human spaceflight, but was recast as a secret reconnaissance platform in 1965 during the height of the Cold War. 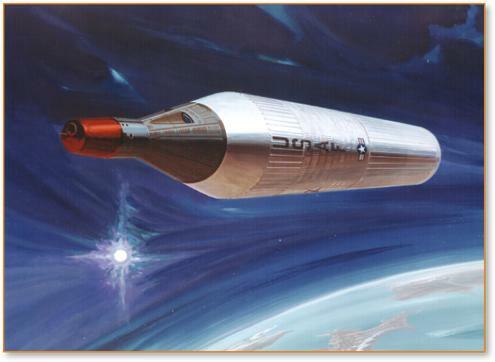 The vehicle would have travelled in low-earth orbit and passed repeatedly over the northern and southern polar regions to better spy on the Soviet Union. This type of orbit incurs greater radiation exposure than orbits closer to the equator because it is less protected by the Earth's gravitational field. In August 1972 — three years after the MOL mission planning was discontinued due to the emergence of cheaper, unmanned satellites — the Earth experienced a historically large solar particle event. Chancellor wondered how typical radiation would have impacted MOL pilots who orbited for 30 days in the thin-shielded vessel and how a massive event like the one in 1972 would have affected someone caught in flight. Combining these factors, sampling them, and simulating them thousands of times on TACC's Lonestar5 supercomputer, Chancellor and his collaborators found that, under normal conditions, the MOL crew would have endured 113.6 millisievert (mSv; a measure of radiation dosage) to their skin and 41.6 mSv to blood forming organs (for instance, bone marrow or lymph nodes) during a 30-day flight — well within the exposure limits for NASA astronauts. "MOL missions in polar orbit would have had even fewer communication opportunities with ground controllers than NASA missions orbiting much closer to the equator — and those were none too frequent – so any mission in flight at the time of that solar event would probably have been terminated immediately," said Charles, co-author of the study. "Whether that would have been soon enough to prevent such dire effects on the pilots is difficult to say." "Tracing 10^11 or 10^15 particles in terms of every interaction at every micron or smaller involves a humongous computational load. The fact that I could parallelize the problem and have 1,000 processors running each computation and do that in three to four hours instead of three to four months is a huge benefit," he said. "The more samples you take, the more accurate the results and the more confidence you have." This rapid turnaround could enable NASA to run much more accurate models than they currently do to determine, in real-time, how a solar storm or other cosmic event might impact astronauts — a capability that may one day save lives.